First line gear (your "kit" should include rifle, knife, ammo, magazines, water - Camelbak or bladder, medical kit, radio, secondary weapon - pistol with extra mags, dump pouch with 550 cord, power bars or beef jerky, other items appropriate for your area). Note: Sir Knight's first line gear weighs 20 pounds and Master Hand Grenade's weighs 18 pounds. Second line gear (3 day pack or equivalent, extra food, survival net, poncho and liner, extra 550 cord, multi-tool) NOTE: the 2nd line gear is mission dependent. The items you put in this kit will depend on your purpose or mission. Note: Sir Knight's second line gear weighs 29 pounds and Master Hand Grenade's weighs 25 pounds. Location to perform drill - preferably private property (doing this in the state park may raise some eyebrows and perhaps your local SWAT team). Without any practice and having never done this before, we were able to set up the hammock and the shelter in less than 30 minutes. Take down time was approximately 10 minutes. This time included securing the 550 cord and removing all of the knots, getting everything back in the pouches and getting ready to roll. This time (both set up and take down) could easily be halved with practice. After reading Joe Nobody's Without Rule of Law, Sir Knight was inspired to make some changes in our survival gear. One thing in particular peaked Sir Knight's interest - the survival net. According to Mr. Nobody, the survival net is an integral part of your kit, regardless of whether you are planning on bugging out or just making your way home when the roads of are closed. Over the course of the past couple of months, Sir Knight and Master Hand Grenade have been refining their 1st, 2nd and 3rd line kits, trying to determine required equipment for every situation. After squaring away most of their other gear, my guys decided that the time had come to try the survival nets and determine if they really were as necessary as Joe Nobody had indicated. Off to the woods we went, 1st and 2nd line gear in tow. Our plan was to put the survival net into service as a field expedient hammock. We located a likely position to set up camp and proceeded to deploy our survival net as a hammock. The first thing we noticed was that once in place (secured to the tree with 550 cord) the hammock had a huge amount of give in it. We had to hang the hammock high in the tree to keep us from hitting the ground when we positioned ourselves to rest. Rather than leaving a significant amount of slack in the cord, we snubbed it rather tightly to the tree. I have to say, the hammock was by far more comfortable than the ground! Now, for you young bucks, the ground may be just fine, but the older you get the harder the ground becomes! When you are in a survival situation, you would be very well served by a good nights sleep, making the hammock a much better option that the cold, hard ground. Can you spot the Hand Grenade? After hanging the hammock, we pulled out a military issue poncho to create a sun/rain shield over the top of the hammock. This was slick. Using the long ends of the paracord (550 cord) we tied two corners of the hammock to the tree, long way, instantly providing cover. Using rope, we secured the other two corners to sticks (instead of tent pegs - we will be adding tent pegs to our second line gear) so the sides of the poncho would spread out, providing more coverage. Not only was the person in the hammock well covered, there was room under the poncho to store gear, keeping it close at hand and out of the weather. Military ponchos are essential, with the shell providing shelter and the liner providing an instant blanket. 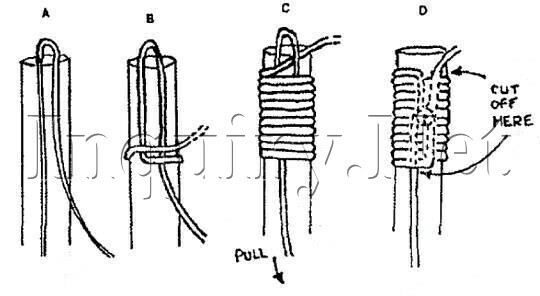 Next, tie a loop and make a slip knot, put that knot over the whipped 550 cord so that it will "bite"
There are no rocks in this hammock! Survival nets are easy to acquire (we bought ours from Old Grouch Surplus). They are inexpensive, making them attainable for every member of your group. Another option is making your own using old fish netting. These really are worth having. In fact, you should never leave home without one. Remember, there is wisdom in not just acquiring gear, but putting it into service. An emergency situation is no time to learn that your gear doesn't work or doesn't fit. Now is the time to hang your hammock, string up your poncho and try wearing your 2nd line gear over the top of your 1st line gear. Put your kit and your skills to the test now so that you can depend upon them later. Put into practice your own Survival 101. Not sure if Grouchy is one of your sponsers, but we just ordered 2 of these on your recommendation! Can't wait to use them for all sorts of things! Survival nets are great for a large variety of functions. One word of caution(from experience). Hammocks should only be used in secure areas. They have a tendancy to hang at "grazing fire" level. First off, nice to still see persons wearing woodland camo. Secondly No chance that you took a pic of the hammock tarp combo from a distance? What a breath of fresh air your site provides. Its so great to see real use full survival tacticts and not the arm chair commando junk as seen on other sites. I,m an old LRRP Ranger and lived real well for years with just the basic items from my ruck as you have displayed in the photos. I would recomment in a full clandistine patrol base when the net is not used that a ponch cover with a single 550 cord with quick release on each end and a branch spreader for each end be used. This setup allows it to be droped on top of patrol members during stand-to and provides concelment. Great stuff, read this site and survivalblog every time i get a chance to get on the internet and always catch up on any posts that i missed! A few respectful suggestions from a former US Marine, line the net with a poncho liner or something so you/ your weapon/ your gear doesn't get stuck in it when you have to move out of it quickly, it would be similar to anyone who has woke up at 0 dark 30 to getting covered in cammy netting and having fun getting it back up after getting everything unstuck while having to use light disipline;also, it will help keep heat in during chilly nights, and make sure it is always emplaced within good cover and concealment. Lastly, get rid of the mags and use good quality 30 rnd mags, small unit tactics dictate that you need to use as many force multipliers whenever possible be it nvgs, full cap mags or what ever small or big you can use to make 1 person like more. Thank you kindly. Yes, we have used the liner directly on the net and it certainly makes it much more tenable. Force multipliers are necessary, especially when you have a small unit. We really appreciate hearing from you Devil Dogs! Thanks a million. Looks like it's right up his alley. Nice! I am reading "holding their own" now and want a survival net. I've been looking online but cannot find one. Could you post a link to a supplier? Could you please post a link to a supplier of the survival net? LOVE how you guys operate! I'm a big USGI gear fan myself. Joe Nobody, thanks for suggesting this link! Good stuff brother. Please feel free to drop my my sight which is a very "like-minded"